Wilson as the editor of his papers came to know and admire him over three decades of dedicated scholarship, and Link's reflections on the work he had just completed. Cold and unsmiling, idealistic but stubborn - these have been the popular images of Woodrow Wilson. In truth, he was a politician of considerable ability, an eloquent speaker, and a man capable of great warmth. A 1993 interview with Arthur S. Link, as he was concluding the 69th and final volume of the Wilson Papers after 35 years, reveals a fuller and more vivid picture of the president , and the compelling tale of Link's dogged perseverance, the joy of discovery, and marvelous luck. 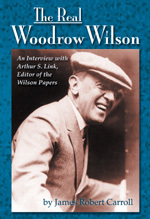 Includes an introduction by the author/interviewer and a chronology of Wilson's life illustrated with numerous photographs. ABOUT THE AUTHOR: A reporter for three decades, Carroll has been covering Washington since 1983, first for the Long Beach, Calif., Press-Telegram and Knight-Ridder Newspapers, and since 1997 as the Washington reporter for the Louisville Courier-Journal. Among other honors, Carroll has won awards from both the National Press Club and the National Press Foundation. He and his wife, Carol Vernon, and their daughters Fiona and Brenna, live in Alexandria, Virginia. "... a useful, compact, and brilliantly assembled study of the 28th president...also a story of literary and historical detective work... Carroll crams a lot in here. ... historical gem.."
Ordering Information: 5" x 7"